2010 was a tough year for my family. We made it through...but somehow didn't have enough get up and go to celebrate the new year. With my husband's big 5-0 coming up, I'm rethinking my outlook. Although the trials and tragedies made a good run at overshadowing the positives this past year, my family experienced many wonderful things as well. Events and growth that are worth celebrating. It goes without saying that one cannot host a Mardi Gras surprize 50th birthday party (snicker) without having some outrageous party favors and props. No worries! My new "go-to" company for costumes has me covered! I discoverd Costume Discounters this past fall, while searching for a Halloween costume for my son. 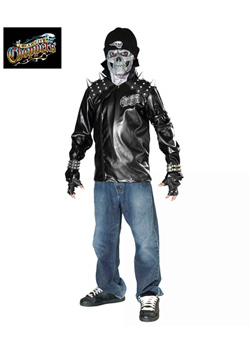 He found a very creepy Biker costume that he instantly settled on. The price was right so I took a chance. 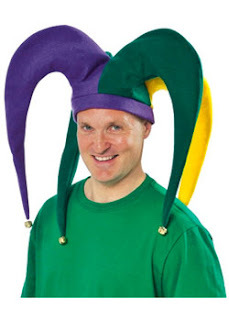 I'm not skilled enough with a needle to make costumes for the kids and Ive been disappointed by both the quality and selection available locally. I was very pleased with the outcome. The costume arrived very quickly and was well packaged for shipment. Much to my son's pleasure, the costume was exactly as pictured and I was impressed with the quality. The jacket was quite thick and sturdy. Even in the brisk weather we experienced for trick-or-treating, he was quite toasty with only a long sleeved T under the jacket. The studded writstband, to my son's delight, were included. The only concern we had was with the mask. It was folded in half in the costume packaging and initially did not seem to want to lay flat. However, after a few days under a phone book, the rubber relaxed and all ended well. Costume Discounters has a very diverse selection of costumes, seemingly for any holiday or event one might imagine, including relevant accessories. I found the quality to be superior to our local costume store and the prices to be at least comparable, if not less expensive. Further, bargain hunters will find an extensive selection within their clearance section. Costume Discounters. Their lowest price guarantee, free exchanges, same day shipping and extensive collection make them my family's "go to" store. The opinions expressed above are honest and my own. I was provided with a costume by Costume Discounters to explore for the purposes of creating this review. 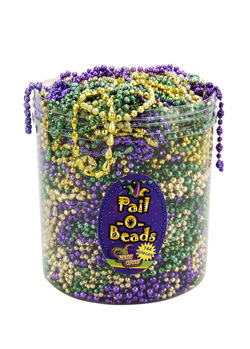 I love all these Mardi Gras items! Hubby is from Louisiana and we love to celebrate Mardi Gras! Now I know where to get awesome party supplies for his work's upcoming party! 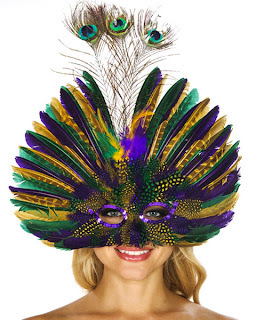 I am in LOVE with that Mardi Gras feathered mask. I can't believe it's only six dollars! Great prices - Great review - I will definitely have to check them out! 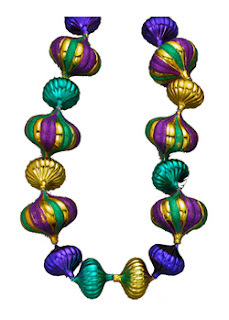 I'm loving those mardi gras garlic beads! 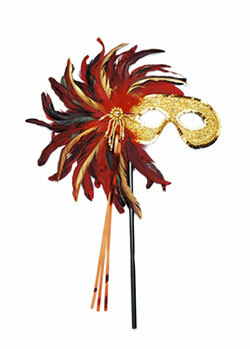 They are totally whimsical and could be used on Halloween too!